Located at Disney Springs West Side, this 5-story, 100,000 sq. ft. attraction houses an array of virtual reality games, fantasy adventure games and classic arcade games. Due to space limitations, strollers are not allowed inside the building. Visitors under age 10 must be accompanied by a responsible person age 16 or older. Certain games offering prize incentives require purchase of tokens to play. Head to the Explore Zone first before the lines form. The Score Zone and Buzz's Astro Blaster also are popular. EXPLORE ZONE: You'll be transported to another world as you experience the Virtual Jungle Cruise while shooting the rapids. 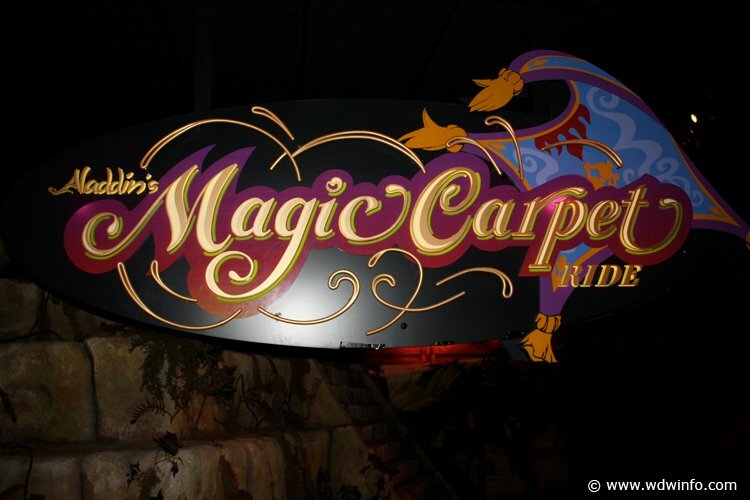 Aladdin's Magic Carpet Ride sends you through Agrabah as you race to release the Genie. Go in search of hidden treasure on the Pirates of the Caribbean: Battle for Buccaneer Gold. SCORE ZONE: Your crew visits other planets as you go on a rescue mission in Invasion! An Alien Encounter. The Mighty Ducks Pinball Slam puts you in the middle of the action. CREATE ZONE: Express yourself in this artistic center. At the Living Easels you can paint a live masterpiece. Create and ride your one of a kind rollercoaster at CyberSpace Mountain. 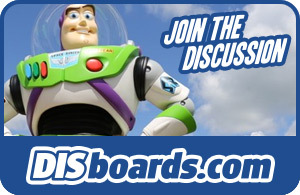 Toy Story fans will love Sid's Create-A-Toy where you can assemble and take home your own toy. Become a Disney animator at the Animation Academy. Budding musical stars can create their own CD by choosing from over 20 styles and 1000 vocals at the Radio Disney SongMaker. REPLAY ZONE: Classic games and rides with Buzz Lightyear's AstroBlaster pitting you against your competitors in a zany bumper car race. Mad Wave Motion Theater gives you a choice of riding a fantasy coaster or steering a high speed race car. The Dance Zone offers the latest dance video games and KidQuest is designed for kids ages 2 - 7. Custom Redemption Games require the purchase of Disney Quest Game Play Cards. Points can be used to redeem prizes. In additon to the games described, there are video games, pinball machines, and all sorts of fun activities. There's no need to leave when you get hungry as you can enjoy lunch, snacks and dessert during your visit. On the 4th floor you will find the Wonderland Cafe, which features some absolutely incredible desserts and specialty coffees. While enjoying your treat you can surf the 'net, e-mail postcards to your friends/family and visit the DIS. On the 5th floor is Food Quest where salads, pizza, sandwiches, and other counter service items are offered. This virtual reality attraction recreates and enhances the Pirates of the Caribbean experience, allowing you to be a pirate in search of treasure on the high seas. You enter into a room that has the front portion of a Pirate ship with six cannons, three on each side. One person in the group is the Captain and he or she does not have a cannon available. As the show begins, a ghost gives you instructions on how to be successful in sinking the other ships to get their treasure. The ghost tells you to get close to the ships to have a better chance of sinking them. The advice is good, but it is best to try to get to a ship side to side not head to head-your cannons don't fire straight when aiming at center screen. Shoot for the sails of the boats as well the hulls. When a boat is sunk you will see it go under and it's treasure will appear on your bow. The ghost reappears towards the end and informs that you have to fight him to keep your treasure. A ghost ship then appears and flying skeletons zealously move towards your bow to get your treasure. You must shoot them; it is the only way to get to protect your booty. At the end of your battle, your score is tallied and your ranking is revealed. 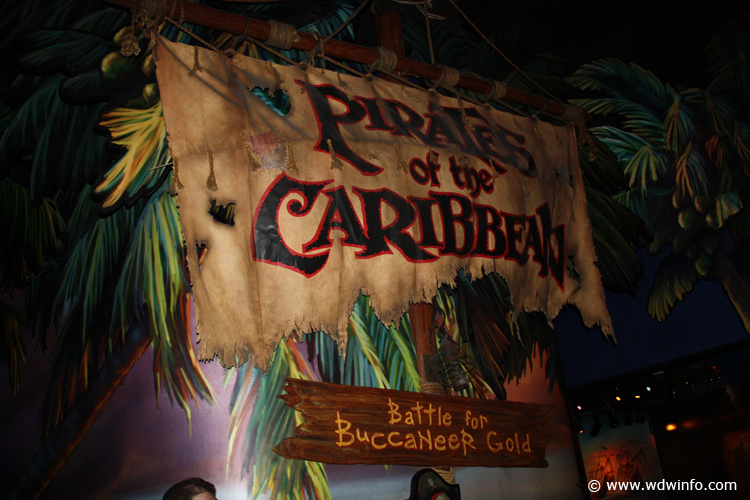 All in all, the Pirates of The Caribbean Search for Buccaneer Gold is a wonderful addition to DisneyQuest-get there early though; the line gets long really quick. When you wait years for something, and it still exceeds your expectations, you know it's a great attraction...Aladdin's Magic Carpet ride is a great attraction. For a few years, Epcot guests could experience a virtual reality magic carpet ride through Agrabah (from Aladdin) as part of an animation attraction. That was in preparation for this attraction. Now, guests can experience this for themselves. You are divided into 3 groups of 4 people each. You are seated on what appears to be a weird motorcycle with a control wheel in front of you (this allows you to go up, down and side to side). You fit the virtual reality helmet onto your head, and your ready for action. True to VR technology, you can look up and down, and side to side, to see your fellow teammates (all of whom appear as Abu the Monkey, each in a different colored vest). Your job is to explore through Agrabah to release the Genie, who is trapped in the cave of wonders. The entire experience lasts 4 1/2 minutes, and is worth ANY wait to experience. Note: There are only 2 groups of 4 stations in the Chicago attraction, and there will only be 2 groups in Philadelphia when it opens. Here again, Disney proves that they can do ANYTHING. 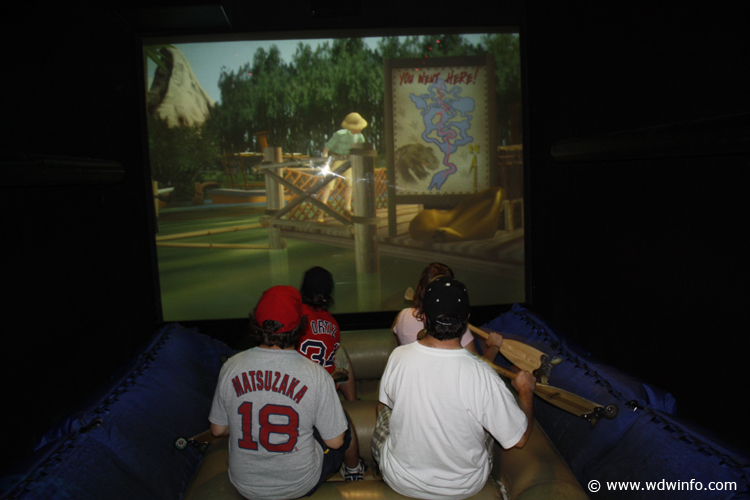 To the right of the Virtual Jungle Cruise, you will notice a bank of monitors with steering wheels. If you look down as you walk over to them, you will see the floor is glass enclosed, and covers a maze with small, remote controlled vehicles moving about. There are small cameras positioned inside those trucks, and the monitors and steering wheels against the wall control them. You maneuver your truck around the maze in an effort to find Inca treasure. When you find treasure, you simply pull up to it to collect it. This attraction also issues tickets which can be redeemed for prizes. 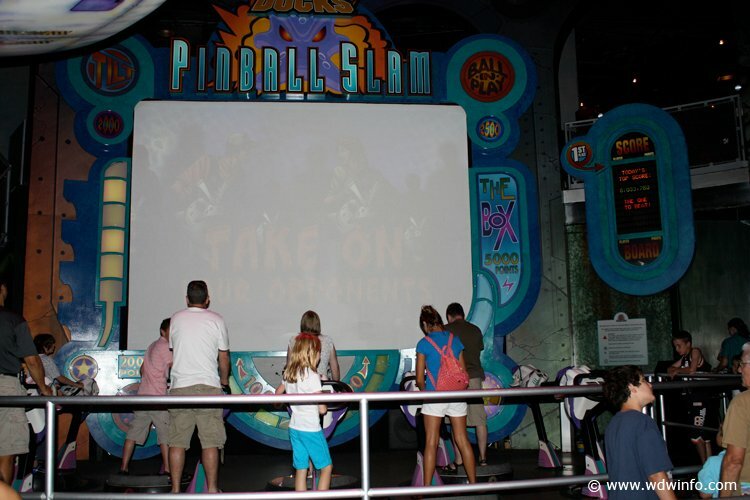 Up to 12 players stand on platforms that move, and control their representation in a pinball game that is displayed on a huge screen in front of them. Also, there is one ADA station that guests of all heights can use a joystick to control their pinball. This is the Sega driving game that was formerly located in Innoventions at Epcot. Up to 8 players can compete in a big screen driving game. This gives you the ability to immerse yourself in a comic book world via virtual reality. You handle a saber, which you use to fight various villains. The animation and control in this game are excellent. But..be warned, if you have a bad back, the seats you rest on are very uncomfortable, and could give you some problems. This is an attraction where three gunners and one pilot attempt to rescue as many colonists as possible and neutralize (yes, neutralize) as many aliens as you can in 3 1/2 minutes. A minimum of two people is recommended. Located in the Create Zone, this attraction will allow guests to create an original song by selecting the style of music, song title, lyrics, and either a male or female singer. You will be able to mix and match from more than 2 billion different combinations to create a truly unique song . Once finished, you can purchase your song (complete in it's own Jewel case, and you can even select the art work for the cover!). The CD can then be purchased at the Guest Gallery! On this amazing attraction, you step up to a console, and are guided through the process of creating your own roller coaster by the virtually annoying Bill Nye the Science Guy. You have the option of inserting corkscrews, loops, breaks in the track, speed up sections and straight-aways to build "the ultimate roller coaster". You can also take the easy way out and use a predesigned coaster (but that's not as fun as creating your own!). Once finished, you step up to a pitch and roll simulator, where you RIDE the roller coaster you just created, complete with every 360 degree turn and bank you create. The experience is AWESOME. This will certainly rank as one of the highlights at Disney Quest. Up to 18 guests can take a mini-course in animation. Guests are seated at computer desks, and are given instruction in how to draw like a Disney animator. When you're finished, you can go to the Guest Gallery and pick up your masterpiece, along with a certificate of completion. Here, you walk up to any one of about 10 consoles and use a joystick to navigate through all the doll parts strewn about Sid's room. You can pick up various pieces to create your own doll. When you are finished, you can go to the Guest Gallery (which is different from GUEST SERVICES) area and purchase the doll you just created !! There are 64 unique items (this refers to common parts...every arm has a matching counterpart, so it's only counted once) to use in creating your doll!! There are some neat features to several of the parts. For example, the baby doll head has eyes that blink, skeleton parts glow in the dark, the wheels actually roll. Toy kits come with extra connectors so you can stick all the appendages out of one socket, or put two toys together (this is only available if you purchase more than one toy..there is no option in the game for this). You sit in front of a mirror, then have your picture taken (which appears on a screen in front of you). From there you have all sorts of tools to distort your face, add different eyes, ears, noses, mouths, etc. At the end, you can opt to purchase your picture at the Guest Gallery. This is a slightly modified version of old fashioned bumper cars, except here they are called "astroblasters". Instead of just bumping into your opponent, you can shoot big nerf like balls at them called "asteroids". The asteroids are collected as you drive over them. The objective is to aim at the pink starbursts on the front and sides of your opponents astroblaster, when firing. A direct hit causes your opponent to lose control and spin 360 degrees. The astroblaster has Plexiglas windows and seats 2. This is set up in much the same style as a standard arcade. This is a great location for younger kids, with games like Skee-Ball which issue you coupons that can be redeemed for prizes. The tickets that you win on games in the Midway and at other locations throughout DisneyQuest, can be traded here for prizes.